Surbhi Rana accused Romil Chaudhary of having ‘buri nazar on girls’ who he calls his sisters. 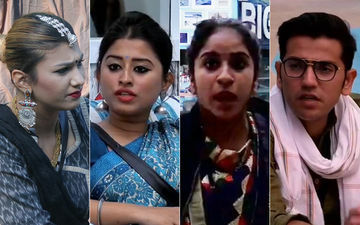 This morning, we brought you a video from Bigg Boss house, that had been doing the rounds of social media, which sees Surbhi Rana accusing Romil of staring at her. Surbhi is heard saying, “Romil Chaudhary apni so-called bhootpurva behan ko kyun ghoorta rehta hai?” This led to the latter breaking into tears and he is seen mouthing, “Aur kitna giregi?” Somi Khan seconds his thoughts and also calls Surbhi “ghatiya”. Earlier, as we saw, in the preview, Dipika, Deepak and Romil are seen targeting Surbhi during the task and they term her ‘fake’. Dipika screams, “Surbhi Rana sabse fake, sabse nakli sadasya hain. Ye sirf aggression ki murat hai.” Deepak goes on to question the housemates for making Surbhi the captain last week.